Plan describing resources necessary for the project, resource procurement / provisioning and resource recovery, is a cycle of processes as is the case for other types of management. 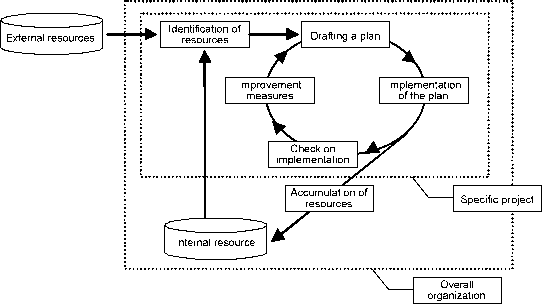 A resource plan is drafted as part of a whole project and its processes form a cycle. Specifically, the cycle consist of identification of resources for a project, drafting a plan to secure them, securing and checking them under the plan, and taking measures when improvement is necessary. This is repeated as a cycle for each project. In addition, if resources that generate new value are obtained in the course of implementing a project, these are included and accumulated as internal resources that can be available to other projects in the organization. This cycle serves as a cycle for the overall organization across the scope of specific projects1. Figure 4-6-2 illustrates the above mentioned process cycle.